RootsFinder.com is a free, online family tree that makes researching family history much easier. In addition, seamless sync with FamilySearch, integration with GenSmarts, evidence analysis, embedded research logs, and DNA tools (coming soon) add to RootsFinder’s powerful offering. Along with these valuable tools, RootsFinder has also developed two Chrome Browser Extensions. The extensions make research and recording information faster and more accurate. 1. 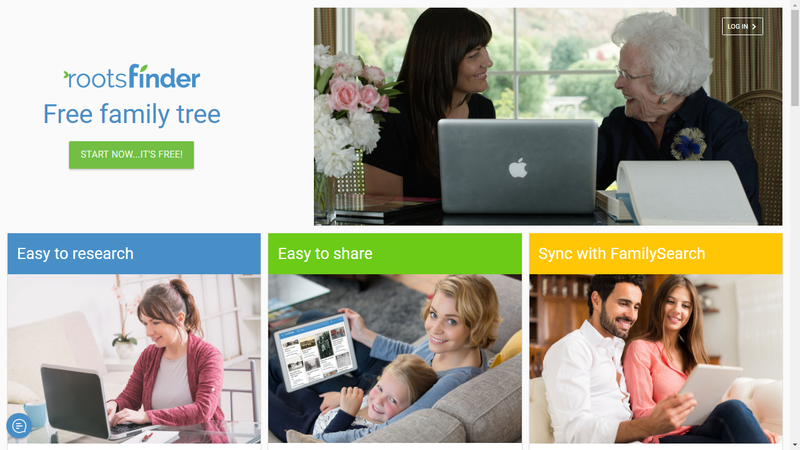 WebClipper - Copy records and source citations quickly and automatically into your family tree from major genealogy websites such as Ancestry, FamilySearch, MyHeritage, and more. It adds records to entire families at once. 2. ToDo Creator - Save search ideas for later by attaching action items to specific people in your family tree, adding them to research logs, and marking them complete when done. Two plans are available: an ad-supported Free-Forever plan, and a $35/year Pro plan that removes ads and includes additional storage and advanced features. Everyone gets a 30-day Pro plan for free. RootsFinder ( https://www.rootsfinder.com ) was founded in 2015 by Dallan Quass, CTO of FamilySearch from 2002-2004 and the creator of WeRelate.org and GenGophers.com, two of FamilyTree Magazine's top 101 genealogy websites. Dallan is joined at RootsFinder by Heather Henderson, Erin Harris, and other experienced genealogists who share his love of family history. NOTE: I have received no remuneration ofor writing this blog post or accessing RootsFinder.com. I am in the process of adding my family tree to RootsFinder. This is very interesting. I hope you will review RootsFinder in your blog after you've had some experience with it. Thank you for posting this and you initial attempt at loading you ancestors. used directly. Does a RootsFinder user get access to those without subscribing?